Away from the vociferous disputes that continue to rage around the Iranian nuclear deal, the Israel's Military Intelligence Directorate and General Staff have been engaged in detached analysis of the short and long-term effects, and they have come away with three central conclusions. Details of their assessments, though shared with defense reporters over recent months, were publicly presented for the first last week by IDF Chief of Staff Lt.-Gen. Gadi Eisenkot during a conference in Tel Aviv, organized by the Institute for National Security Studies. The most immediate consequence of the nuclear deal will be felt in the realm of expanding Iranian regional influence, and the looming increase in the trafficking of weapons and funds to terror organizations, made possible by sanctions relief. 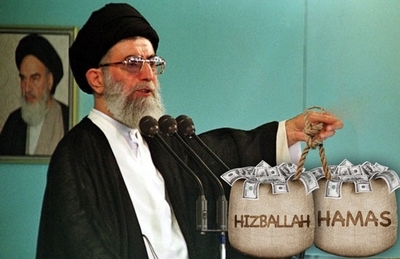 Iran now sends Hizballah between $800 million to $1 billion every year, according to Israel Defense Forces (IDF) assessments. There is every reason to expect Hizballah's funding to significantly increase in the next two years, as Iran stands to earn many billions of dollars in oil and gas sales, and receives access to $100 billion in previously frozen assets. Iran sends Hamas in the Gaza Strip tens of millions of dollars per year, instructs it on how to mass produce rockets, and tries to smuggle weapons into Gaza. Iran's budget for Hamas will grow, too. Additionally, the Iranian military industry, already considered to be an advanced stage of development by Israel, will receive much more investment, allowing Iran to design and produce more accurate missiles, rockets, drones, and other types of weaponry that it can then traffic to its regional proxies through its Revolutionary Guard-Quds Force (IRGC) networks, or point at Israel directly from Iranian missile bases. IRGC-Quds Force activities in Syria, where Iran oversees and participates in battles to save its ally, the Assad regime (Iran has lost between 300 to 400 of its security forces in Syria's battles), and seeks to convert its presence on the Syrian Golan into terrorist bases against Israel, can also be expected to be expand. "The assessment is that as the economic situation in Iran improves, bigger assets will be diverted [to these things]," Eisenkot said Jan. 18. Regarding the Iranian nuclear program itself, the military divides its view between the short and long-term. Since the end of 2005, Iran topped the list of strategic threats to Israel due to its military nuclear program. With Iran inching toward nuclear breakout capabilities, the IDF had to be ready to respond to any potential imminent developments. The nuclear deal changes that situation, at least for the next five years. Although Israel will make every effort to monitor and scrutinize Iran's activities, the expectation within the defense establishment is that the risk of an imminent Iranian breakout to the bomb has substantially decreased for the next few years. The thinking in Israel's military establishment is that the Supreme Leader Ayatollah Khamenei has not forfeited his ambition to build nuclear weapons. Far from it. He has, however, taken a tactical 'pause' to achieve sanctions relief and assure the future of his regime. After the five-year mark passes, the next decade carries increased risks of Iran secretly developing nuclear weapons. Alternatively, Iran can wait out the agreement's sunset clause, and reactivate its nuclear program in 10 to 15 years, after it has amassed far greater regional influence, military capabilities, wealth, and international legitimacy. This is one reason why Eisenkot has said that whoever is in his position a decade from now will face significantly more complex challenges. Iran then will be a significantly more formidable enemy than it is today. In the meantime, Iran will continue its proxy war against Israel, and Hizballah armed with over 100,000 surface to surface rockets and missiles, will work with Iran to make some of those projectiles accurate, satellite-guided threats, which it can try to direct against strategic sites in Israel. Israel, for its part, is developing an advanced multi-layer rocket and missile defense system to counter this. Despite its heavy losses in Syria's civil war, Hizballah's home turf of Lebanon remains the base of the most formidable conventional military threat facing Israel today. Hizballah has built rocket launchers into civilian homes in 240 Shi'ite villages and towns across southern Lebanon, set up underground command and control bunkers, and built rings of protection around them. One out of every 10 homes in Lebanon has been turned into a hidden Hizballah rocket launcher, with roofs that open specially for the launch. A decade ago, Hizballah had just 10 percent of its current number of projectiles. Meanwhile, Hizballah, which has been operating under direct Iranian command since the 2006 Second Lebanon War, is seeking to become a Shi'ite hegemonic force in Lebanon. It remains deterred by Israel's overwhelming firepower, its wish to avoid opening a second front, and its awareness of Israel's deep intelligence penetration into the organization. But Hizballah is gaining valuable experience in operating ground forces in Syria, and that experience will be brought to bear in cross-border raids against Israel in any future clash. None of these developments can be separated from the Iran nuclear deal. The more powerful and influential Iran becomes, the more confident, daring, and wealthy Hizballah will be, and the bigger its stockpiles of projectiles (already one of the largest in the world) will become. Yaakov Lappin is the Jerusalem Post's military and national security affairs correspondent, and author of The Virtual Caliphate (Potomac Books), which proposes that jihadis on the internet have established a virtual Islamist state. Read more at Investigative Project. Is This the Most Terrifying Photo of 2015? TRUMP: The Evangelicals’ New Hope? Do you suffer from Islamist Denial Syndrome?